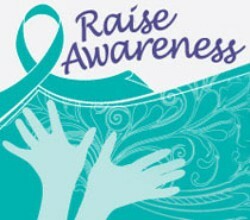 September is Ovarian Cancer Awareness Month but we need to raise awareness every day of the year! Do your part to raise awareness! Wear teal on National Wear Teal Day on Friday, September 6, 2098 and encourage your friends, family, and co-workers to do the same! Watch for our upcoming newsletter that will contain an awareness message you can share via e-mail as well as on Facebook, Twitter, and Instagram! Yard signs are ALWAYS available! Just stop by the COCA office (1777 S. Bellaire St., Suite 170) for your supply! Teal tree ribbons are also available at the COCA office. Ask if you can put up an awareness poster up on the lunch room bulletin board. Share information about symptoms and risk factors with your co-workers by providing each one with a symptom card! Arrange a workplace "Lunch and Learn" session and a COCA staff member or volunteer can come speak to your group about ovarian cancer symptoms and risk factors. Put up an awareness poster at your local coffee house or locally owned shop! Make symptom cards available at your church or synagogue or put an awareness poster up on the bulletin board. Would your club or organization like to have someone come talk about ovarian cancer? We have speakers ready, willing and able to do just that! Just ask! COCA has symptom cards, posters, yard signs, brochures and everything you need to raise awareness in September...and beyond. Visit the COCA office at 1777 S. Bellaire Street, Suite 170, Denver any week day from 9:00 am to 5:00 pm to pick up your materials. If you want a speaker for your group, please contact Jeanene@Colo-OvarianCancer.org.